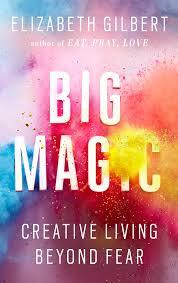 a book chick: "Big Magic"
my take: This is a celebration of CREATIVITY based on the idea that we humans are made to make - to CREATE - in the likeness of our CREATOR. (I have a child who says he's not artistic ... creativity and art-ability are not the same thing...can't wait till this kid gets home from college so I can [lovingly] accost him with this news). Baking, dancing, knitting, getting tattoos ... all the arts and all their expressions are included. And anything that involves taking bits of something and creating something else. Ms. Gilbert writes like your hip older sister giving you the secrets to the cool life and also like the youngest rebel wild child giving you permission to add some spice to life. She's fun, funny, daring, quirky, self-deprecating, curious, and willing to share the experience of her own creative dance. my source: Liz and I are Facebook friends and Instagram buds. She tells me everything.